The Rams (3-3) lost both games of their road double header against the Millersville Marauders (2-0) in Millersville, Pennsylvania, Sunday afternoon, March 4, by scores of 12-10 and 12-11. These games were originally slated for Saturday, but weather concerns caused the games to be moved to Sunday. Both games Sunday had their share of offensive output, as shown by the 22 runs scored in the first game followed by 23 in the late game. In the first game of the day, Shepherd got out to an early 5-0 lead by the time Millersville went to bat in the bottom of the third inning. 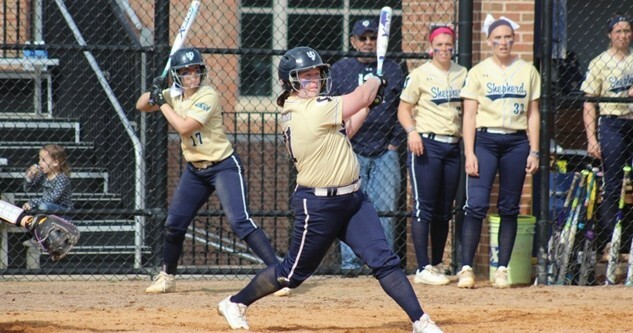 Shepherd senior designated hitter Molly Staley brought home fellow Rams baserunners in freshman second basemen Leann Brown and junior catcher Rachel Taylor with her first at bat to help ignite the initial run. This gave the Rams a 3-0 lead in the top of the first inning. Staley had two hits, three RBIs, and scored a run in the opening game of the back to back. Fellow senior left fielder Jessica Robinson led the way for the Rams in the hits category with her four hits on four plate appearances, including four RBIs. Robinson hit a solo-shot home run in the top of the sixth inning to bring the lead over the Marauders to7-6 after the Marauders had come storming back in the bottom of the third and fourth innings. 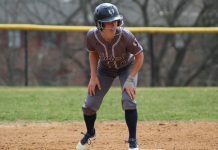 The comeback was in large part due to a grand slam from Marauders sophomore shortstop Rebecca Blatt in the bottom of the third inning. Millersville was able to come back and tie the game up at 8-8 in the bottom of the sixth inning after a two-RBI triple from freshman right fielder Faith Willenbrock. The Marauders took the lead for good after an unforced error by Taylor allowed Willenbrock to score from third, making the score 9-8 in favor of the Marauders. Later in the inning, another Rams’ error, this time a wild pitch from Rams junior pitcher Lori Sturgill, gave enough time for Marauders senior second basemen Kaelyn Buskey to advance to third base. Millersville finished the sixth inning with 12 runs after the Rams’ third error in the inning by Brown, allowing Marauders Buskey and Marauders sophomore first basemen Macy Koontz to come in to score to stretch the Marauders’ lead to four with a 12-8 score. The Rams attempted a late comeback with a two-RBI single from Robinson in the top of the seventh inning that reduced the deficit to two with a 12-10 score, but things would not get any better for Shepherd. The Marauders went on to win the game by 12-10 by getting Robinson out thanks to a force out at second to end the game. Rams head coach Marissa Leslie, via email, following the game, explained the difficulties of playing on the road in Millersville instead of at home in Shepherdstown. Koontz led the way for Millersville in the opening game by notching two hits on three at bats while also scoring two runs as a base runner in an all-around effort. The second game of the day went through multiple swings of momentum, with the Rams falling behind 5-0 in the bottom of the first inning thanks to a three-run homerun from Marauders senior catcher Megan McCurdy. Then, the Rams had their own offensive explosion in the top of the third inning to the tune of 11 runs. The keys to the Rams producing this volume of runs were from three separate two-RBI hits from Taylor, Robinson and Staley. The Rams maintained an 11-7 lead after Marauders junior basemen Maggie Murphy hit a two-run home run in the bottom of the third inning, also bringing in Willenbrock after the play. 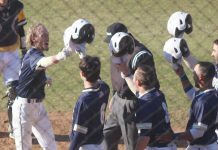 The Rams’ offense fell flat after the huge third inning, as they failed to get another run across. Millersville slowly chipped away at the lead before overtaking it in the bottom of the seventh inning. Marauders freshman second basemen Allie Janowiak was crucial in the late game push to regain the lead for good with two hits in the bottom of the third and fifth innings that resulted in two-RBIs to help bring the score to 11-10. Later in the same inning, she also scored the game-tying run off a fielder’s choice by the Rams defense. Janowiak then proceeded to score the 12th and final run of the game for the Marauders on a wild pitch by Rams senior pitcher Kaitlin Munda in the bottom of the seventh inning of the night cap, giving the Marauders a 12-11 victory. Munda (L, 1-1) also picked up her first loss of the season after allowing two runs on four hits in two and two-thirds innings pitched. Leslie cited the need for the Rams to exhibit better fundamentals and to not leave runners on base as main reasons why the Rams came up short in both games against the Marauders on Sunday afternoon. 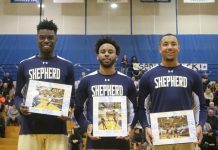 Through six games, Shepherd has .500 record at 3-3, as it now looks onto the upcoming Salem Tournament in Salem, Virginia, starting on Friday afternoon, March. 9. The Rams will play East Stroudsburg on Friday afternoon at 1, followed by Indiana University of Pennsylvania at 3 p.m. Previous articleTougher gun laws needed in U.S.